What to do when it takes too long to get hot water. How to get hot water fast in the kitchen or bathroom sink using the following methods! In response to frequently asked questions and comments that it takes too long for hot water to reach the shower or sink, check out the recommended solutions below. One solution is recommended when buying a new tankless water heater, and it includes selecting the model with the built-in recirculation feature. The recommended models are reviewed below. The other solution applies to the tank-type models and requires an installation of the hot water booster or a circulation pump with the recirculation line. The problem with the slow hot water delivery can be avoided if the installation was planned properly – resulting in less headache, complaints, water and energy waste, also higher bills. The adequately installed water heater is vital for a long-term and unobstructed operation and hot water delivery. A water heater should be installed with the piping system that is as short as possible, and near the fixtures that use hot water; in the bathrooms, kitchen, laundry, garage, and wherever hot water is needed. If there is a distant sink that requires a long pipe run = slow hot water delivery, install a point-of-use water heater (POU), such as an Eemax, Tempra or Tronic tankless or Ariston as the small tank-type. If the distance between the heater and the fixture is long, it will take some time before hot water is delivered, because the cold water is already stored in the pipes between the source and the fixture and needs to be pushed out. Shorter the distance is, faster the cold water will be removed from the pipes and faster you will get hot water, no matter is it a tankless or tank-type water heater. It is also recommended to insulate all the water lines, especially if it runs through the rooms with the lower temperature. So, when it comes to buying a water heater, do not rely on marketing terms “instantaneous.” Instant or to be more accurate almost instant is possible with the provided solutions below; recirculation and hot water boosters. 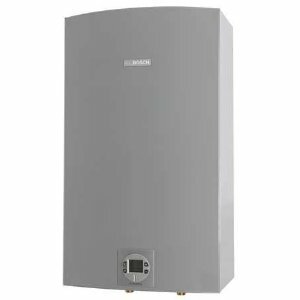 If looking to buy a tankless water heater that has a built-in recirculation system, choose the Navien NPE-A or Rinnai RUR series. Navien NPE-A series offers three models for different home sizes: NPE-180A, NPE-210A and NPE-240A heating potable water with up to 199,900 BTU gas input and up to 11.2 GPM (35F temp. rise) of water flow. This is sufficient for large homes with up to 4 bathrooms. These specs are coming from the largest model NPE-240A, but if you need less power/water flow, choose one of the two smaller models. All the models are equipped with the internal circulation pump, but an external pump can also be added to the water heating system and for recirculation applications, but it should be sized appropriately to provide the right water flow. The circulation pump is what speeds up the hot water delivery. 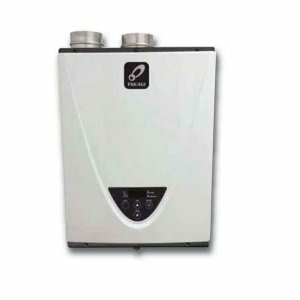 This ultra-high efficient series of tankless water heaters can achieve a high energy factor of 0.95 providing high savings to the users, while due to the low gas emission burner, environment-friendly operation. One of the greatest features found on Navien NPE-A models, and what makes it different from other models or brands, is the ComfortFlow Technology. The ComfortFlow technology can minimize the water temperature fluctuation within the system, resulting in more pleasant showers and hot water delivered when needed. This is possible because the system recognizes the usage pattern while saving water and time when using the recirculation mode. Only the NPE-A models can provide two pre-heating modes; internal and external recirculation mode. The recirculation mode is selected by changing the position of the DIP switch (default is OFF) and positioning of the 2-way valve. As it can be seen below, it is easy to switch between two modes. No matter which mode is chosen you will have hot water delivered fast with the less “cold-water-sandwiching” and with no minimum water flow rate required. Even if there is a need for more hot water and in any situation, cascading capability allows up to 16 units to be linked into one system. Also, for the perfect work, all these features are controlled from one main command center found on the front panel of the unit. The advanced electronics allows users easy control, monitoring, and troubleshooting with the given error codes from the diagnostics system. Also, the maintenance is important. For example, an inlet water filter that is located inside the cold-water inlet must be cleaned periodically to maintain proper water flow. Any obstructions inside the filter will result in reduced flow and slow water delivery. 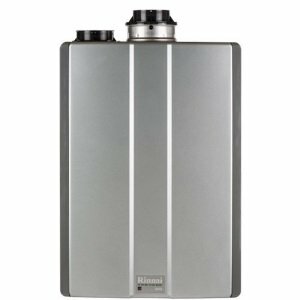 Rinnai tankless RUR water heaters are, as the above Navien, tankless units that produce hot water in endless supply and thanks to the advanced electronics, with the consistent temperature where the cold-water-sandwiching is almost eliminated. The powerful and Eco-friendly gas burner is capable of producing a maximum power of 199,000 BTU and delivering up to 9.8 GPM of hot water to multiple fixtures and high demanding applications, resulting in the superb efficiency and Ultra Low NOx gas emission. The RUR models can also be remotely monitored and controlled by the smartphone, providing great energy and money savings, comfort and convenience. What makes Rinnai RUR series a good pick for faster hot water delivery, is its compliance with the ThermaCirc360 - water heating recirculation technology, so even if there is no dedicated return line, hot water is delivered fast. Instantaneous, or almost instantaneous hot water delivery results in reduced time and energy waste. 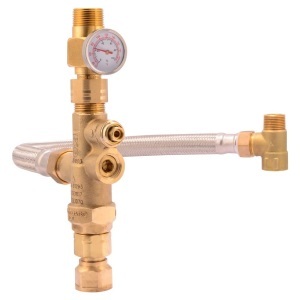 ThermaCirc360 recirculation technology utilizes the bypass technology, internal pump, Circ-Logic recirculation technology, 24-hr digital controller and thermal bypass valve. Recirculation technology is what ensures faster hot water delivery throughout the home, reducing the wait time for hot water, and improving convenience and comfort. It also reduces energy consumption and greenhouse emission. 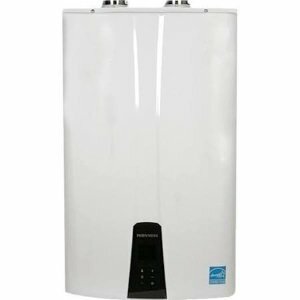 If you are the owner of the electric or gas tank-type water heater and hot water reaches the shower or the tap slowly and insufficiently, or you are running out of hot water fast, a solution is to install a water heater booster. 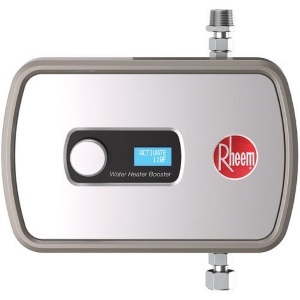 A small point-of-use water heater can be used as a booster, such as the one from Rheem RTEX. According to the manufacturers, boosters can increase hot water delivery by close to 50%, also increase performance and comfort, if installed per instructions. 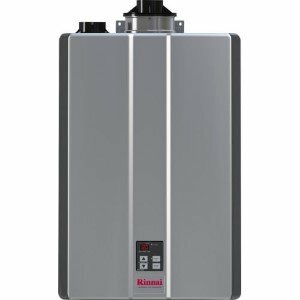 So, per Rheem, if you own a 30-gallon short unit, with the booster it becomes as the 40-gal medium unit, or if you own a 50-gal tall model, it becomes as the 80-gal unit – meaning more capacity is available to you. This small electric unit has only a few pounds, making it easy to install directly to any tank or a nearby wall. You can also buy a water heater mixing valve that works as the tank booster, where the higher temperatures inside the tank can be set. This is an easy add-on feature that connects cold inlet and hot outlet, mixing both cold and hot water, resulting in the lower outgoing temperature, delivered to all fixtures. This way water will be delivered with the safe temperatures - preventing injuries from scalding. Since hot water can be stored at a higher temperature, there is less Legionella growth inside the tank. Per the manufacturer info, this type of the booster can increase the amount of usable water up to more than 200%, but it varies. There are also other available options for getting hot water faster, such as installing the circulation pump, such as this Grundfos and a dedicated line from the water heater to the point-of-service, or installing an instant hot water dispenser such as Insinkerator... but it all depends on what you need or want.